I love meeting people in the ecological food movement. Take for example, Gavin Morrison, owner, designer and builder at Edible Landscaping Ottawa. 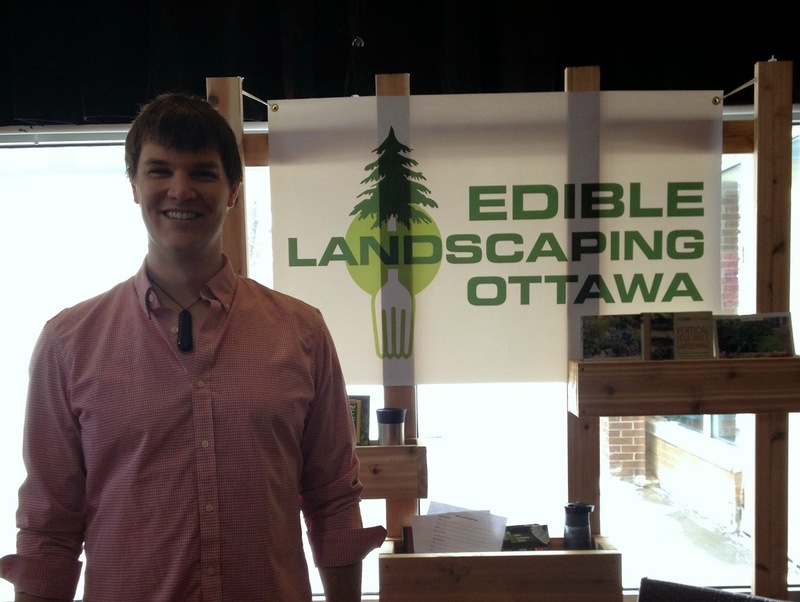 Edible Landscaping Ottawa “designs, builds, and installs innovative landscape designs to create beautiful and functional green spaces.” The thing that excites me most though, is their goal to offer organically grown edibles as part of their landscaping projects! Gavin Morrison of Edible Landscaping Ottawa at Seedy Saturday 2014. Edible Landscaping Ottawa has its roots in the birth of Gavin’s daughter. Gavin and his wife were dedicated to nurturing her with healthy organic foods from the start and so they decided to grow some in their own backyard as a cost-effective and extra satisfying way of doing so. Their enjoyment and belief in their small backyard garden fuelled the creation of Edible Landscaping Ottawa as a business. I really admire anyone who takes the leap from great idea/ideals to new business so I sat down to chat with Gavin about the launch of Edible Landscaping Ottawa. Well, we are a traditional landscaping firm that specializes in helping our clients grow edibles to bring their family and the food they eat together. We are all about offering options and removing barriers for people who want to eat local, organically grown produce right from their backyard! What do you mean by edible landscaping? Edible Landscaping is a balanced mix of traditional landscaping and edible plants, what we call an “edible infusion”. We need the balance as edibles can have a very short period of time when they are beautiful so the ornamentals add that balance so that the garden is functional and tasty. Some examples would be blueberry bushes instead of a cedar hedge or some beautiful and delicious chard for pops of colour in the flower bed. What are some of the reasons people give for not gardening, even though they want to? If space is an issue, there are ways to work with what you’ve got, like going vertical. We can work out a design that combines livable space with dinner growing right beside you. You don’t have to feel like you are living in a vegetable patch, we can find a workable balance. And if you don’t know how to grow edibles, I can help teach you what you need to know! Tell me more about the planting packages for the edible landscaping services. A planting package can include putting in hot crops in the spring and cool crops in the fall. I hope to plant alongside my clients as I see myself more in a teacher/consultant role than a gardener. I also offer individual consults for trouble-shooting pests and growing problems, as well as vacation maintenance packages (watering etc.). I really want to enable the experience of growing veggies to be as user friendly as possible for my clients so I help however I can. Are you certified organic or working towards that? While there isn’t a framework in place for a landscape company to become certified organic, I do source our resources as organically as possible. This means organic plants, mushroom compost for fertility and screened top soil with no additives. If there is a question of soil contamination in a yard, we can opt for vertical or raised beds. How do you envision your work growing in the future? On top of bringing creative and livable green spaces to fruition in people’s yard, I want to host a member’s area on my website to build a community that shares knowledge, resources and a passion for growing. I want it to be an information hub for my clients about local food and gardening. I’m currently developing recipes with a chef focusing on seasonal produce. What do you hope people get from your services? It is all about the experience! I want to help families in Ottawa experience the joy of growing their own food. At the same time, I hope my clients feel they can gain back a little control of what they are putting in their bodies when they eat, and that they can prioritize healthy foods on a budget that works for them. Edible landscaping is a great opportunity to teach our kids about food and to practice sustainability. I want to help parents feel confident about growing their own food, passing on that experience to their kids and showing them what really fresh food tastes like. I love hearing, “I never thought our backyard could look like that!” I love the work and building and being outside, but hearing that a client spent every night that summer having dinner on their new deck is the best part. Seeing the satisfaction on my clients’ faces and hearing about how their kids enjoyed the fresh food that they grew is amazing! Thanks for sharing your thoughts with us Gavin. Best of luck with your first season! Hi Rachelle, I'm only just catching up on your blog posts from the past few months. I love this interview you did. I'm also loving our farm share! Thank you!